Hiking Lac Beauvert in Jasper National Park | Jasper National Park Alberta – Jasper travel, tours and hotels. JASPER, ALBERTA—Canada—Lac Beauvert offers some of the most stunning natural colors in Jasper, Alberta, with beautiful multicolored waters resting beside Jasper Park Lodge. And not only is the hike beautiful, it’s relatively short—perfect for newbie hikers or seasoned experts looking for a relaxing jaunt through the Canadian Rockies. Hiking time: Just over 1 hour to complete the hike. 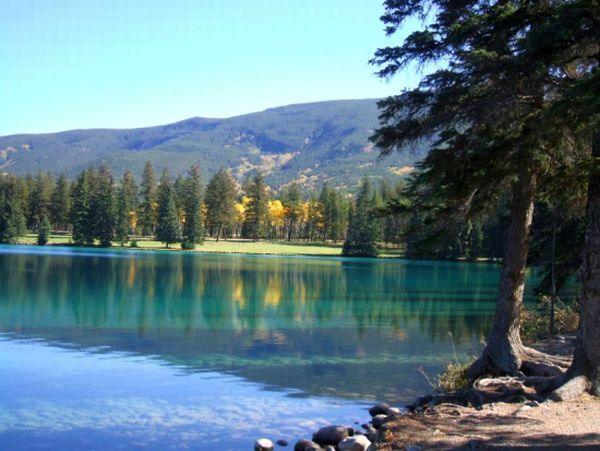 The Lac Beauvert trailhead is easily recognizable by its proximity to the Jasper Park Lodge. From Jasper, Alberta, turn southeast off Connaught Drive and onto Hazel Avenue until you’ve crossed the railway to Highway 16. Take a left at the next intersection and continue toward the Old Fort Point trailhead. From there, it’s only one more kilometer to the parking area at the south end of Lac Beauvert. National Park, until the loop closes. The wildlife in Jasper National Park are as abundant in this area as they are elsewhere. Elk are often spotted near the golf course and hikers visiting during elk calving season will need to keep an eye out for bears. This quick, relaxing hike is among the most beautiful in Jasper National Park, so be sure to bring a camera to capture the multicolored waters of Lac Beauvert. You may have enough energy left to check out some other things to do in Jasper, Alberta, like rafting or a relaxing round of golf. When hiking and looking for things to do in Banff and Jasper, book all of your Canadian Rockies activities at Jasper Vacations, the official activities provider for Jasper National Park.